Bouzouki instructor teaching a child how to play the instrument properly. Are your children looking for fun activities that are interesting and challenging? Then encourage them to give bouzoukis a try. The Greeks have been using the name “tambouras” in reference to a series of stringed musical instruments resembling the bouzouki. With the use of a small plectrum known as the “penna”, the bouzouki is able to produce sounds from three or four double sets of strings with higher tuned strings called the katini and lower tuned strings called the bourgana. If these interesting bits of information sparked your curiosity, then it’s time to get started on bouzouki for kids! A young boy playing the bouzouki flawlessly. Is bouzouki for your kids? It is better undergo training before attempting to play the bouzouki. The initial stages of learning are critical-although learning how to play the bouzouki can be self-taught, there are some bad habits within the playing technique that self-taught players can develop. Bouzouki lessons are not to be taken lightly- it is more of a long-term and focused investment of both time and energy. Look for a second-hand bouzouki that is in good condition. This lessens expenses just in case your children decides to learn how to play other instruments. Look for bouzouki music schools or music teachers. Bouzouki is not as popular as its counterparts like the guitar, banjo, ukulele, and others stringed instruments. Look for a music school or a music teacher in your area that offers bouzouki music lessons along with teaching how to read bouzouki tabs. Get your kids to start playing the bouzouki! What is a bouzouki? A bouzouki, also known as a bozuk or pandura, is a three- or four-course stringed instrument that is used in Greek and Irish music. It comes in various sizes, shapes and depths of body, lengths of neck and number of strings. To get started on bouzouki for kids, online lessons are available for self-teaching, but there are also experienced bouzouki instructors in New Zealand who offer bouzouki lessons to beginners, intermediate, and advanced students. Music classes and lessons depend on the skill level and understanding of the student. 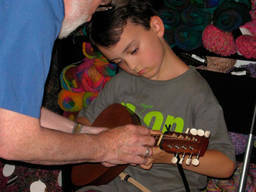 Are your children interested in learning how to play the bouzouki? Take advantage of their tender age by showing how fun and entertaining learning a new instrument can be. Although one of the more underrated activities for kids, the bouzouki offers a unique sound and a wide-range of songs to be learned and played. Bouzouki lessons lets children develop a profound sense of virtuosity due to the thorough and focused approach of playing traditional songs. For more information or tips on bouzouki for kids in New Zealand or other kids activities, visit our ActiveActivities directory. There are also more activities available on our directory for children and toddlers to enjoy. Let your children improve some of their innate skills through Bouzouki for kids!